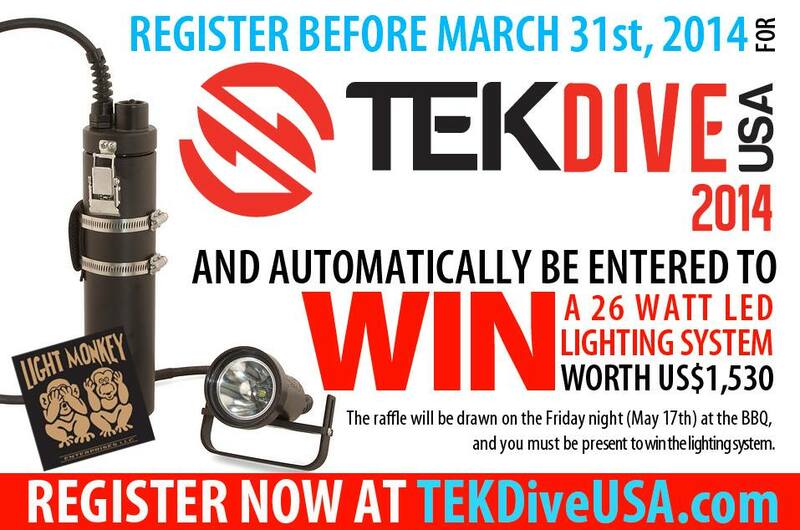 TEKDiveUSA.2014 – Your chance to win! Win a Light Monkey Lighting System! Not bought your TEKDiveUSA.2014 ticket yet? This is the month to do so! From now until the 31st March you have the opportunity to win something rather gorgeous thanks to the lovely folks at Light Monkey. You could leave TEKDiveUSA.2014 the proud owner of a beautiful Light Monkey 26 watt LED lighting system worth US$1,530. Simply buy a day pass and BBQ ticket, or weekend pass and BBQ ticket for TEKDiveUSA during March 2014. Then attend the Friday night BBQ Social (17th May) where this free draw will take place. You must be present to win this gorgeous lighting system. For those of you who have already bought your tickets, don’t panic. Your name has already been entered in this amazing free draw. Now all you need to do is make sure you have got your BBQ ticket and you are there on the night. TEKDiveUSA, just a diver who is curious to know more. You will leave empowered and enthused about your diving. During the weekend 40 different exciting talks, useful workshops and edcuational clinics will cover many aspects of advanced and technical diving. From wreck, cave and physiology through to technique, safety and imaging. Leading speakers are flying in from all over the globe to talk at TEKDiveUSA.2014. Want quality time with rebreather manufacturers? Thinking of buying a multi gas dive computer? Looking for fantastic destinations that effortlessly cater for your specific diving needs? Considering upgrading your exposure protection? Reviewing your general diving equipment? Would like advice on lights and reels? Seeking guidance on further training? Karl Shreeves and Mark Caney from PADI will be attending TEKDiveUSA. This is your opportunity to get good face time with all the TEKDiveUSA.2014 specialist exhibitors. Come and discuss your diving requirements and get all your equipment, training and destination questions answered by the experts. The Gala Awards Dinner is the night where we celebrate success, catch up with old friends and make new ones. Register now to guarantee your place. Log onto http://www.tekdiveusa.com to secure your place at this amazing dive event. Over 100 divers have already bought their tickets. Don’t miss out – book now to avoid disappointment. Next PostNext Type R Rebreather requirements update.